With the signing deadline rapidly approaching teams throughout the league have begun locking up their players for the upcoming year. Any team who does not sign their players by July 1st runs the risk of them signing with another team or going to arbitration. This time of year is stressful for team owners and GM’s all over the United States and Canada. With Colorado having not played a game since the end of the regular season on April 10th one would think they’d have almost finished signing their free agents, but that is definitely not the case. Colorado currently has 13 unrestricted free agents (including Adam Foote and Peter Forsberg who have announced their retirement) and 14 restricted free agents. Realistically Colorado has 25 players left to sign. 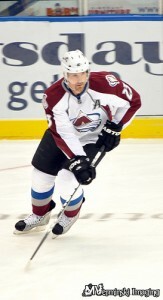 There have been small signs of life out of the Avs camp with the signing of Milan Hejduk to a one year $2.6 million deal with $400,000 in bonuses for a total cap hit of $3 million. It has not been officially announced yet, but last week the Avs signed left winger Patrick Bordeleau to a one year deal. The only other announcements from the Avs is that they will not be negotiating a new contact with goaltenders Peter Budaj or Brandon Maxwell. That leaves Brian Elliott as our lone NHL goalie who, by the way, also needs a new contract, but is a RFA. The Avs minor league affiliate the Lake Erie Monsters are also in need of goaltending with both John Grahame and Jason Bacashihua eligible for free agency on July first. Colorado does have the cap space to spend money on a goaltender and with some capable guys hitting the market (Tomas Vokoun, Jean-Sebastien Giguere, and Josh Harding among others) come July first it’s a big possibility that the Avs will attempt to get one of these guys. Another viable option is to look into the trade market so Budaj or other players aren’t lost to free agency without getting anything in return. There is, of course, no way of knowing who the organization plans on re-signing by July 1st, but Tomas Fleischmann, Greg Mauldin, David Van Der Gulik, David Liffiton, and Bacashihua are guys that should be signed to new contracts before the July first deadline. The restricted free agents are less of a priority since the team has the ability to match or counter-offer any contracts that are offered to those players. Teams that sign RFA’s are also required to provide compensation (draft picks) so if any RFA’s are let go the Avs would at least be getting something in return. However, RFA’s that should be signed by Colorado are T.J. Galiardi, David Jones, Kevin Porter, Philippe Dupuis, Ryan O’Byrne, Ryan Wilson, Kyle Cumiskey, Brian Elliott, Ryan Stoa, and Tom Fritsche. I’m sure the Colorado brass have been negotiating with players or maybe has even already signed players without officially releasing it. 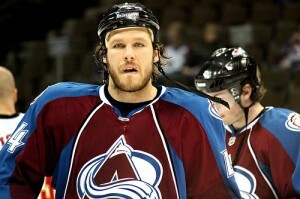 The Avs are known for running a tight camp and keeping things under wraps for the most part. Look at the Bordeleau signing. There still hasn’t been any official release from the Avs about his one year deal, but other media outlets have released the news. With a little more than 15 days to do until the July 1st deadline the time is now to start signing players for next year. You know what they say, there’s no time like the present.